Previous work has implicated the cytokine leukemia inhibitory factor (LIF) in cutaneous inflammation, although results have differed as to whether LIF is pro- or anti-inflammatory in this setting. We examined edema, inflammatory cell infiltration, and cytokine responses following CFA injection in the adult mouse footpad. Inflammatory cell infiltration and edema are significantly enhanced when CFA is injected in LIF knockout mice as compared with injection of wild-type littermates. Moreover, local injection of an adenoviral vector encoding LIF suppresses both measures of inflammation. In contrast, injection of an adenoviral vector encoding β-galactosidase has no discernable effect on inflammation. In addition, comparison of the CFA responses in LIF knockout vs wild-type skin reveals that LIF is an important regulator of IL-1β, IL-6, IL-7, IL-2Rα, and IFN-γ in cutaneous inflammation. These and our previous data indicate that both endogenous and exogenous LIF are anti-inflammatory in the CFA model and that LIF is a key regulator of the cytokine cascade. The results also indicate that adenoviral gene delivery can be an effective therapeutic approach in this paradigm. Inflammation of the skin is a serious medical problem. Depending on the country, epidermal irritants and allergic reactions comprise 20–70% of all occupational diseases. There are also chronic skin diseases such as psoriasis, which is one of the most common immune-mediated diseases in humans, that affect 2–3% of the population. In addition, excessive exposure to UV radiation can cause inflammation as well as local and systemic immunosuppression and skin cancer. In each of these conditions, cytokines play a key role in initiating and maintaining pathophysiology as well as in inducing recovery (1, 2, 3, 4). Of these cytokines, TNF and IL-1 are considered to be primary initiators of cutaneous inflammation, with IL-4, -6, -7, -8, -10, and -11, IFN-γ, and TGF-β also being implicated. The cytokines that play key regulatory roles in this cascade are of clinical interest as potential targets of therapeutic intervention; e.g., subcutaneous delivery of IL-10 or -11 to patients with psoriasis can ameliorate this condition (5, 6). Leukemia inhibitory factor (LIF)6 is also important in this context, as this cytokine can induce proinflammatory as well as anti-inflammatory effects, depending on the tissue and the form of perturbation (reviewed in Ref. 7). Experiments with LIF knockout (KO) mice have shown that endogenous LIF is required for normal neuronal and glial responses to injury in the central and peripheral nervous systems (7, 8). Following sciatic nerve injury, LIF is required for normal inflammatory cell infiltration, and LIF is directly and indirectly chemotactic for macrophages (8, 9). In the periphery, injection of high concentrations of LIF into skin or joints can induce swelling and leukocyte invasion (10, 11). In striking contrast, we found that endogenous LIF is anti-inflammatory in the CFA model of cutaneous inflammation and that injection of LIF strongly reduces pain in this model (12). To clarify further the role of LIF in the cytokine cascade of cutaneous inflammation and to determine the efficacy of viral delivery in treating this condition, we have investigated CFA-induced inflammation in normal and LIF KO mice and used a LIF adenoviral construct to deliver the cytokine. We also report the first findings on the cytokine cascade induced by CFA in the skin, some of which are surprising. The strain of LIF KO−/− mice used in this work was that of Stewart et al. (13), which has been intermittently backcrossed with the C57BL/6 strain to maintain fertility and viability. Genotypes were determined by the PCR (12), and all comparisons were made only among mice of the same age. All animal procedures conformed to the requirements of the Caltech Research Animal Care and Use Committee. The adenoviral vector was derived from adenovirus serotype 5 deleted of its E1 and E3 regions. Recombinant adenovirus containing lacZ (AdlacZ), LIF (AdLIF), or no transgene (AdPacI) were constructed with the transgene under the control of the CMV promoter. The 293 cells expressing the E1A and E1B proteins support the replication of E1A-defective mutants (obtained from N. Davidson’s laboratory at Caltech) and were maintained in DMEM (Life Technologies, Rockville, MD) containing 2% FCS. Following infection, cells were harvested, resuspended in culture medium, and subjected to three rounds of freezing and thawing. Cell debris were eliminated by centrifugation at 3000 × g at 4°C for 15 min. Crude viral supernatants were layered on a discontinuous CsCl gradient and centrifuged for 2 h at 36,000 rpm. Isolated viral particles were then subjected to a second round of CsCl centrifugation. Viral particles were collected, dialyzed against buffer containing 10 mM HEPES (pH 7.5), 140 mM NaCl, 1 mM MgCl, and 10% glycerol, aliquoted, and frozen at −80°C. Viral titers were assayed by plaque assay on 293 cells and expressed as PFUs/ml. Mice were anesthetized with isoflurane. Viral stocks of AdPacI, AdlacZ, and AdLIF were thawed and diluted in PBS (1 mM Ca2+ +1 mM Mg2+), and a final volume of 10 μl (3 × 109 particles) was injected intradermally with a Hamilton microsyringe (80301) and a Hamilton needle (90033; Hamilton, Reno, Nevada) into the skin of the footpad. An acute inflammatory lesion was produced by injection into the plantar surface of the hind paw, under isoflurane anesthesia, of 20 μl of CFA (1 mg/ml Mycobacterium tuberculosis (H37Ra, ATCC 25177) in 0.85 ml of paraffin oil and 0.15 ml of mannide monooleate (Sigma, St. Louis, MO). Edema was assayed by measuring paw diameter using calipers applied across the dorsoventral midplane of the hind paw. Footpads were removed from mice following perfusion with PBS buffer and then 2% paraformaldehyde, postfixed with 2% paraformaldehyde for 30 min, and then immersed in 30% sucrose in PBS overnight before OCT embedding. Frozen sections of 10 μm were taken at multiple levels through the block. Following immersion in 5-bromo-4-chloro-3-indolyl β-d-galactoside (X-Gal) reagent (5 mM K3Fe(CN)6, 5 mM K4Fe(CN)6, 25 mM MgCl2, and 2 mg/ml X-Gal; Roche Molecular Biochemicals, Indianapolis, IN) for 4 h at 37°C, sections were counterstained with eosin and examined by light microscopy. Sections stained with X-Gal reagent were blocked with 2% swine serum for 2 h at room temperature (RT) and then immunostained overnight at 4°C with polyclonal goat anti-LIF Abs (R&D Systems, Minneapolis, MN) at a 1:2000 dilution in 2% swine serum in PBS. Biotinylated swine anti-goat IgG (Roche) was then applied for 2 h at RT. Slides were mounted with Permount and examined by light microscopy. Macrophages were identified by immunostaining with the F4/80 Ab, while the Mac-1 Ab was used to stain macrophages and neutrophils (BioSource International, Camarillo, CA). Frozen sections were rinsed three times in PBS at RT and endogenous peroxidase was blocked with 3% H2O2 in PBS for 10 min at RT. Nonspecific Ab binding was blocked with 2% normal rabbit serum (Sigma) for 2 h. The primary Abs were diluted with 2% normal rabbit serum in PBS (1:2500 for Mac-1 and 1:250 for F4/80) and applied to sections overnight at 4°C. Sections were incubated with biotinylated rabbit anti-rat IgG at a 1:200 dilution for 1 h, followed by the developing solutions from the avidin-biotin complex kit and substrate very intense purple kits (Vecastain Elite avidin-biotin complex kit; Vector Laboratories, Burlingame, CA). Immunostaining was quantified by optically scanning photographs using frames placed in the AdLIF or AdlacZ injection sites. Four frames were used for each section and three sections were used per footpad. Data from four footpads of two mice of each group were used to calculate the mean and SEM. Background OD outside of the skin tissue was subtracted from each frame before quantification. Footpad skin was removed under deep terminal pentobarbital anesthesia, and total RNA was extracted using the single-step method (16). Total RNA from two feet of the same mouse was treated as one sample. Three mice were used for each group. Multiprobe template mCK-3b and mCK-L (custom template sets; PharMingen, San Diego, CA) contained DNA templates for the following cytokines: TNF-α and -β, IL-6, IFN-γ, TGF-β1, -β2, and -β3, IL-12p32 and p40, IL-7, IL-1α, IL-1β, IL-1R antagonist, LIF, IL-2Rα, and the housekeeping genes L32 (ribosomal RNA) and GAPDH. The assay was performed according to the manufacturer’s protocol. Briefly, DNA templates were used to synthesize probes, which were labeled with [α-32P]UTP (3000 Ci/mmol, 10 μCi/μl; DuPont NEN Research Products, Boston, MA) in the presence of a GACU pool using a T7 polymerase. Each probe was hybridized overnight at 56°C with 15–20 μg of total RNA, followed by digestion with RNase A and T1. The samples were then treated with proteinase K-SDS mixture, extracted with phenol-chloroform, and precipitated in the presence of ammonium acetate. Samples were loaded on an acrylamide-urea sequencing gel, with undigested labeled probes, and run at 50 W with 0.5× TBE (208 g Tris base, 55 g Boric acid, 40 ml 0.5 M Tris EDTA (pH 8.0), autoclaved 20 min.) for 2.5 h. The gel was dried on filter paper under vacuum. For quantitation, the dried gel was placed in a PhosphorImager (Molecular Dynamics, Sunnyvale, CA) cassette and exposed to a Kodak Storage phosphor screen (Kodak, Rochester, NY) at RT for 1–2 wk. This screen was scanned with a QuantiScan sensitometer, and analysis was done with ImageQuant (Molecular Dynamics) software. Background OD in the same lane (obtained from a frame of the same size) was subtracted from the cytokine band and the resulting value was expressed as a ratio to L32 and GAPDH. The AdLIF and AdlacZ viruses were produced as described above and tested for LIF activity using the M1 cell assay. 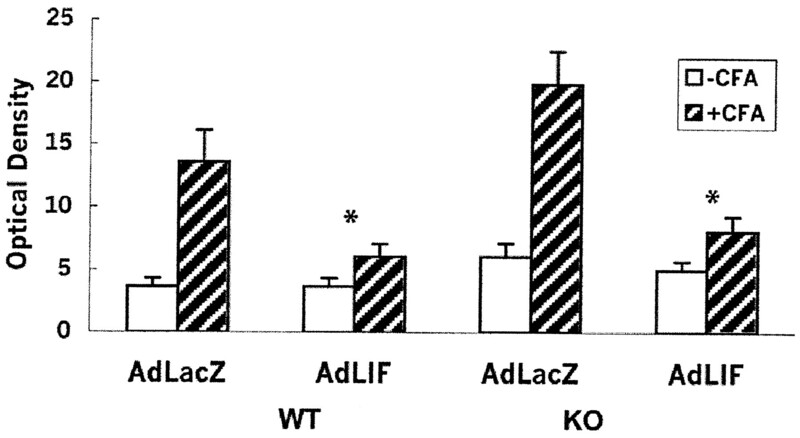 Recombinant LIF at 10 ng/ml inhibits growth 68%, while supernatants from cells infected with AdLIF and AdlacZ inhibit growth 44 and 4%, respectively. In a similar experiment, we found that an anti-LIF Ab is able to block this activity. In addition, anti-LIF Abs stain dermal cells in the skin of the footpad 4 days following infection with AdLIF and AdlacZ (Fig. 1⇓C) but not following infection with AdlacZ alone (Fig. 1⇓D). To confirm infection by the latter virus, sections were stained for β-galactosidase and are positive (Fig. 1⇓A). We were also able to independently localize viral infection in the case of AdLIF by coinfecting with AdlacZ and double-staining sections for LIF and β-galactosidase (Fig. 1⇓C). As expected, both viruses infect the same localized area, and in a minority of cases, single cells stain for both proteins. 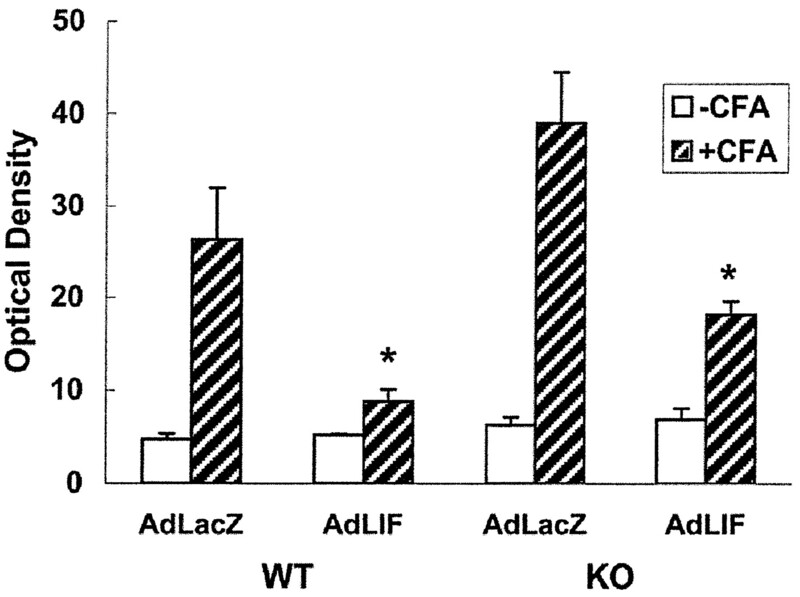 Infection of adult mouse footpad with AdLIF and AdlacZ results in expression of LIF and β-galactosidase. Four days after injection of AdlacZ virus (A) or control AdPacI virus (B), sections were stained for β-galactosidase activity. Blue cells are seen only in the case of AdlacZ infection. In a similar experiment, footpads were injected with both AdLIF and AdlacZ (C) or just AdlacZ (D), and sections taken 4 days later were stained for both LIF and β-galactosidase. Cells staining red with the anti-LIF Ab are found in C but not in D. Moreover, some cells in C are double labeled for LIF and β-galactosidase (arrow). These results, taken together with the results of the culture assays (see text), indicate that AdLIF successfully infects the skin and results in the expression of LIF protein and activity. Original magnification, ×200. To determine the optimal time frame in which to study cutaneous inflammation in this CFA model, edema as well as Mac-1 and F4/80 staining of macrophages was quantified in wild-type (WT) mice at 6 h and 1, 2, 3, and 6 days after CFA injection. The peak of edema and F4/80 staining is clearly at 2 days, whereas peak Mac-1 staining is nearly equivalent at 1 and 2 days (data not shown). Therefore, the 2-day time point was chosen for subsequent experiments. Injection of CFA increases footpad thickness 55% in WT and 92% in the LIF KO mice (Fig. 2⇓). This result is very similar to the 2-fold difference seen in our previous work (12), indicating that endogenous LIF suppresses the edema induced by CFA. In this experiment, the controls were injected with AdlacZ virus as well as CFA to control for effects of viral infection in the AdLIF experiments. Additional experiments showed, however, that injection of AdlacZ causes no additional swelling, with or without CFA injection (data not shown). Infection with AdLIF at the same time as CFA results in suppression of the swelling response to CFA, both in the WT and KO. In the WT, the exogenous LIF suppresses swelling by ∼45% and in the KO, exogenous LIF suppresses swelling by about 35%. Both of these differences are significant (Student’s t test, p < .001; n = 4). Endogenous and exogenously delivered LIF negatively regulate edema induced by CFA. Both WT and LIF KO mouse footpads were injected with CFA and edema was examined 48 h later. Swelling is expressed as the percent change in the dorsoventral paw diameter compared with pre-CFA treatment levels. The open bars display the data from controls that were injected with CFA and AdlacZ. The striped bars display the data from paws injected with CFA and AdLIF. Edema in the KO footpad is significantly greater than in the WT (∗∗, p < 0.001). In addition, injection of AdLIF significantly reduces the swelling response to CFA in both WT and LIF KO skin (∗, p < 0.001). 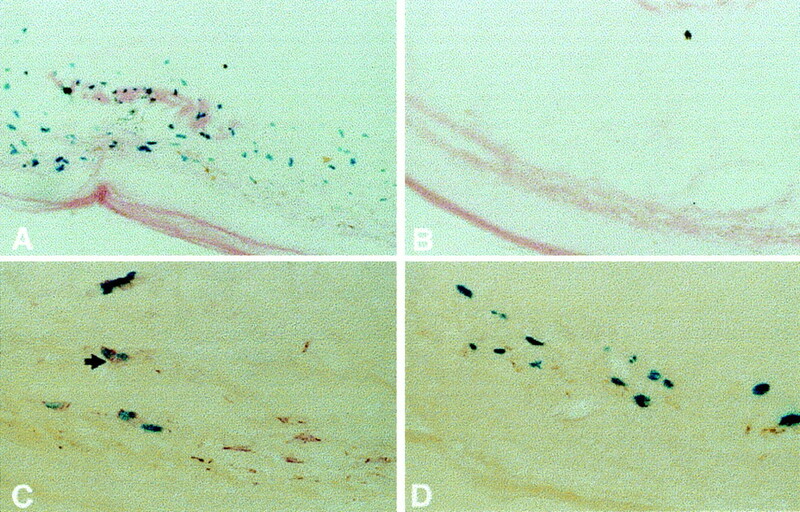 To assess inflammatory cell infiltration following CFA injection, sections were stained with Mac-1 and F4/80. Injection of CFA increases Mac-1 staining of macrophages and neutrophils ∼5-fold in the WT and 7-fold in the LIF KO (Figs. 3⇓ and 4⇓). This difference between the genotypes in their response to CFA was observed previously, where we found 4.8-fold more neutrophils and 2-fold more mast cells in the inflamed dermis of KO vs WT mice, both in the absence of AdlacZ infection (12). The fact that Mac-1 staining does not rise even higher in the LIF KO could reflect that action of other anti-inflammatory cytokines such as IL-10 or IL-11, as considered in Discussion. Injection of AdLIF suppresses the CFA-induced increase in Mac-1 staining in both genotypes; in the WT, the increase with CFA in the presence of AdLIF is only about one-seventh of normal and about one-third in the KO with AdLIF (p < 0.05). As a control for the viral infection in the AdLIF experiments, the controls were also injected with AdlacZ. No difference in Mac-1 or F4/80 staining was observed with AdlacZ infection when compared with paired footpads, with or without CFA (data not shown). Histology reveals that injection of AdLIF inhibits Mac-1+ inflammatory cell infiltration caused by CFA. Representative sections are shown from non-CFA (A, C, E, and G) and CFA-injected (B, D, F, and H) footpads 2 days after CFA and viral injection. Footpads from WT (A–D) and LIF KO (E–H) were injected with either AdlacZ (A, B, E, and F) or AdLIF (C, D, G, and H). In both genotypes, CFA elicits an increase in Mac-1 staining and AdLIF reduces this increase. 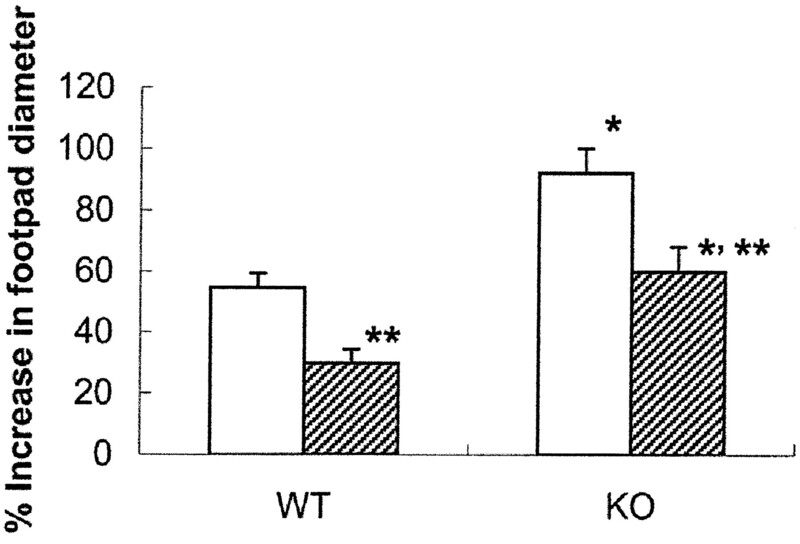 Also noteworthy is that CFA elicits much greater Mac-1 staining in the LIF KO than in the WT (B vs F). No increase in staining is seen in AdlacZ-infected skin compared with nonvirally injected skin (data not shown). Original magnification, ×200. Quantification of Mac-1+ staining reveals that injection of AdLIF inhibits inflammatory cell infiltration caused by CFA. As described in Materials and Methods, staining was analyzed by multiple optical scans of multiple sections. As was apparent from the sections presented in Fig. 3⇑, CFA strongly increases Mac-1 staining in both genotypes, but the induction is stronger in the absence of LIF (KO) (p < 0.05). Moreover, AdLIF injection suppresses the increases in Mac-1 staining in both genotypes (∗, p < 0.05). Data are expressed as mean ± SEM. Very similar results were obtained for F4/80 staining, which is more specific for macrophages than Mac-1. Injection of AdLIF suppresses the CFA-mediated induction of F4/80 ∼4-fold in the WT and over 4-fold in the KO (Figs. 5⇓ and 6⇓). These differences are significant (p < 0.05). Thus, exogenous LIF, delivered simultaneously with CFA, effectively suppresses inflammatory cell infiltration nearly to background levels. 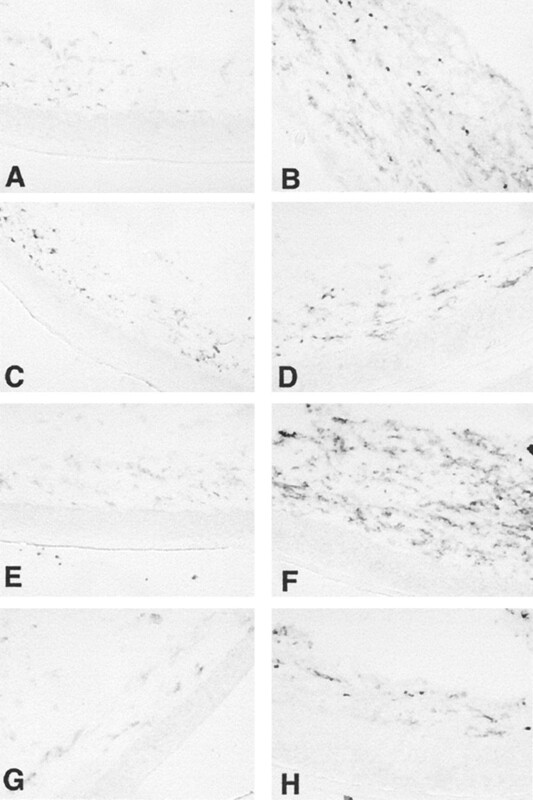 Histology reveals that injection of AdLIF inhibits F4/80+ inflammatory cell infiltration caused by CFA. Representative sections are shown from non-CFA (A, C, E, and G) and CFA-injected (B, D, F, and H) footpads 2 days after CFA and viral injection. Footpads from WT (A–D) and LIF KO (E–H) were injected with either AdlacZ (A, B, E, and F) or AdLIF (C, D, G, and H). In both genotypes, CFA elicits an increase in F4/80 staining and AdLIF reduces this increase. 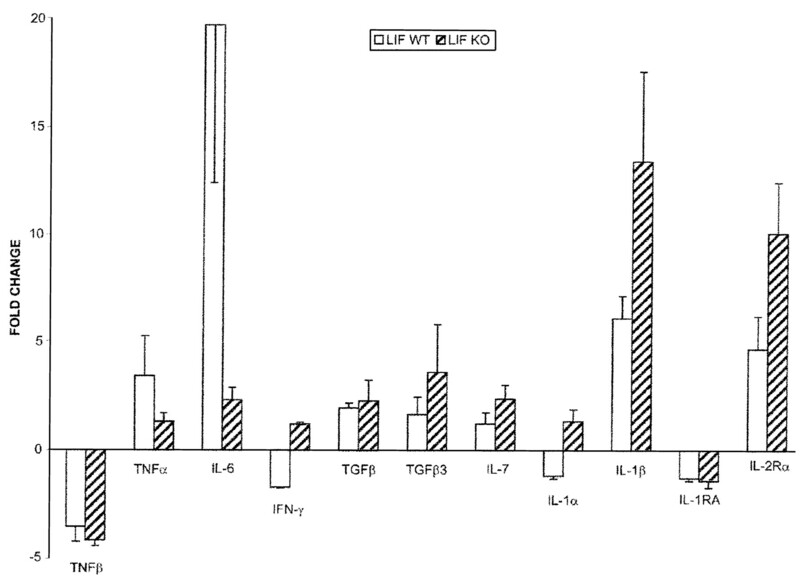 Also noteworthy is that CFA elicits much greater F4/80 staining in the LIF KO than in the WT (B vs F). No increase in staining is seen in AdlacZ-infected skin compared with nonvirally injected skin (data not shown). Original magnification, ×200. To further assess the role of LIF in this paradigm, we assayed the mRNA levels for a variety of cytokines and their receptors. This was done in both WT and KO footpads, with and without CFA injection. The results are expressed as the fold induction of each cytokine caused by CFA. Although this type of data has not been previously published for this paradigm to our knowledge, we predicted that CFA would increase the levels of proinflammatory cytokines. Indeed, in the WT footpads, CFA strongly induces IL-6 (p < 0.03), and induces other proinflammatory cytokines such as TNF-α (p < 0.08), IL-1β (p < 0.01), and the receptor for IL-2 (IL-2Rα)(p < 0.03) to a lesser degree (Fig. 7⇓). Interestingly, CFA lowers the level of IFN-γ (p < 0.05), a proinflammatory cytokine, and raises the levels of the anti-inflammatory cytokine TGF-β1 (p < 0.03). It may be that at this 2-day time point, the anti-inflammatory response has begun to restore the normal state of the tissue. The other apparent effects of CFA on cytokine expression in the WT (TNF-β, TGF-β, TGF-β3, IL-7, and IL-1α,) are not statistically significant. The p values given here represent comparisons of cytokine mRNA levels in the presence and absence of CFA to those in WT, where n = 3 for each. Endogenous LIF regulates the cytokine cascade induced by CFA. Cytokine mRNA levels in skin were measured using the RNase protection assay 2 days after CFA or saline injection. Cytokines were normalized to GAPDH + L32 in the same lane and then expressed as ratios to their values from non-CFA-injected footpads. The absence of LIF in the KO results in a significant suppression of the CFA-mediated induction of TNF-α and IL-6. In contrast, the absence of LIF resulted in enhanced CFA-mediated induction of IFN-γ, IL-7, IL-1β, and IL-2Rα. The level of significance (p) of each of these comparisons is given in Results. Data are expressed as mean ± SD. Regarding the role of LIF in this cascade, we find that CFA induces a significantly larger IL-1β response in the LIF KO than in the WT (p < 0.05), which reproduces our earlier finding on IL-1β protein (12). Moreover, in the absence of LIF, the increases in IL-2Rα (p < 0.02) and IL-7 (p < 0.04) are greater than in the WT, and the CFA-induced suppression of IFN-γ is turned into an increase in the absence of LIF (p < 0.001). These results are consistent with an anti-inflammatory role of endogenous LIF. Surprisingly, however, the CFA-induced increase in IL-6 is much less in the LIF KO than in the WT (p < 0.03) (Fig. 7⇑). This strong effect is considered further in Discussion. Clearly, in the CFA model, the endogenous LIF response to CFA regulates a number of important cytokines and their receptors. Since contradictory conclusions have been made regarding the role of LIF in cutaneous inflammation, we have revisited this issue using the additional technique of viral delivery of LIF and also using an additional measure of inflammation, the expression of 11 relevant cytokines. The latter data are particularly useful, as no such information is apparently available for the CFA model. It is also important to investigate the potential utility of viral gene therapy in an animal model of cutaneous inflammation, particularly given the relative ease of using this technique with skin and the importance of this clinical problem. The present results with the LIF KO mouse confirm our previous experiments showing that CFA-induced edema and inflammatory cell infiltration are more severe in the absence of endogenous LIF. The prior work also found that injection of recombinant LIF protein reduced the CFA-mediated induction of IL-1β and nerve growth factor, but this injection was unable to suppress edema (12). The present approach of raising LIF levels via an adenoviral vector is more efficacious, reducing swelling in the WT by almost half as well as very strongly suppressing inflammatory cell infiltration and proinflammatory cytokine levels. The suppression of macrophage infiltration was 3- to 7-fold, depending on the genotype of the mouse and the macrophage marker used. These strong effects may be surprising in view of the fact that only a small minority of skin cells were obviously infected by the virus, and production and release of LIF would be delayed in comparison to the injection of LIF protein itself. The relative effectiveness of the viral approach may be due to its longer lasting effects relative to an injected protein. We have found strong anti-LIF staining for at least 2 wk following delivery of AdLIF to the brain (K. Oishi, S. C. Lee, and P. H. Patterson, unpublished observations). The use of an adenoviral vector in this context is not without potential problems, however, as there are reports of a similar virus causing an inflammatory reaction (cf Ref. 17). Under the conditions used here, we did not observe any evidence of such a reaction to either theAdlacZ or the AdPac1, and the AdLIF construct suppressed inflammation rather than inducing it. This lack of obvious response to the control vectors could be due to the relatively low levels of virus used in these experiments. It would be worthwhile investigating the effect of a second challenge with virus, as this has been reported to elicit a strong inflammatory reaction at the original site of infection, at least in the brain (18). Our findings that both endogenous and exogenous LIF are anti-inflammatory in the skin are inconsistent with results reported by others. Injection of high doses of LIF into the ear pinnae of mice increased ear thickness (11), and systemic injection of high levels of LIF induced a prolonged hypersensitivity to mechanical stimulation (19). We previously found that injection of low amounts of LIF into the footpad is analgesic (12). It may be that exogenous LIF displays a biphasic dose dependence in peripheral inflammation, with low doses, which likely correspond to endogenous levels induced by injury, being anti-inflammatory (7). It is also worth noting that within the peripheral and CNS, LIF is strongly proinflammatory, inducing inflammatory cell infiltration, microglial and astrocyte activation, and neuronal injury responses (7, 8). It may be that the skin contains a cell type not present within the nervous system, and this cell may respond to LIF by producing a strong anti-inflammatory agent. We compared the responses of a variety of cytokines and their receptors to CFA in WT vs LIF KO skin. These data show that LIF is an important regulator of IL-1β, IL-2Rα, IL-6, IL-7, and IFN-γ. Although there were no previous data available on cytokine expression in the CFA skin model, considerable work has been done on cytokine changes in other forms of cutaneous inflammation, particularly psoriasis (1, 2, 3, 4, 20). A number of type 1 cytokines are up-regulated, including IL-2, IL-6, IL-8, IL-12, IL-18, IFN-γ, and TNF-α. In contrast, relatively low levels of anti-inflammatory cytokines such as IL-1R antagonist and IL-10 have been found in this chronic condition. Perturbation of endogenous cytokines or application of exogenous cytokines has been used to assess their relative roles. In a study of the role of endogenous IL-10 in cutaneous wound healing, it was shown that local injection of an anti-IL-10 Ab caused increased inflammatory cell infiltration and increased levels of chemokines and proinflammatory cytokines (21). Transgenic mice overexpressing IL-1α in keratinocytes exhibit spontaneous skin disease and focal inflammatory lesions (22). Injection of IL-12 can overcome UV-induced immune suppression, and this cytokine can overcome or reverse superantigen-induced suppression (23, 24). Local injection of IL-1β, but not IL-1α or TNF-α, mimicked cytokine changes induced by allergen, and injection of anti-IL-1β Abs prevented sensitization to allergen (25). Notably, preliminary clinical trials have reported amelioration of psoriatic lesions and suppression of proinflammatory cytokines upon local application of IL-10 (5) or IL-11 (6). The latter result can be viewed as very consistent with our results, as IL-11 and LIF belong to the same cytokine family and induce the same signaling cascades. It has not yet been shown, however, that the receptors for LIF and IL-11 are on the same cells in human or mouse skin. The targets and sources of these cytokines in cutaneous inflammation is an area that deserves more attention. The roles of IL-1 and TNF have also been investigated in their respective receptor KO mice. The skin of such mice does not display serious abnormalities in response to organic solvent, detergent, or mechanical disruption (26), despite the fact that levels of these cytokines are normally increased by such treatments. In contrast, IL-7 is a keratinocyte-derived growth factor important for the development of γδT cells, including mouse dendritic epidermal T cells (DETC) (27). Expression of this cytokine is increased in psoriasis (28), and injection of an anti-IL-7 Ab inhibits γδT cell accumulation in lymph nodes following skin sensitization (29, 30). Moreover, transgenic mice overexpressing IL-7 in keratinocytes develop a lymphoproliferative skin disease (31, 32, 33, 34). Our finding that IL-7 is up-regulated by CFA and that LIF suppresses this is therefore of added interest. In view of our findings that IL-1β, IL-7, IFN-γ, and IL-2Rα are all increased in the absence of LIF, it is surprising that the response of IL-6 to CFA is reduced in the LIF KO. This is not consistent with the view of IL-6 being proinflammatory and LIF exerting anti-inflammatory effects in this model. We found previously that endogenous IL-6 and LIF are each proinflammatory in brain injury, but that the double KO did not exhibit a more pronounced phenotype than the single KOs (8). We suggested that rather than acting in redundant, parallel pathways, these two cytokines may be acting in series, in the same pathway, one controlling the expression of the other. Our present result in cutaneous inflammation can be viewed as consistent with this notion, suggesting an anti-inflammatory role for IL-6. Supporting this hypothesis is the result from a model of skin damage with UVB irradiation, where it was found that IL-6 KO mice displayed a more severe reaction, and IL-10 levels were suppressed compared with WT (35). This is also consistent with the IL-11 results discussed above, as LIF, IL-6, and IL-11 belong to the same family and induce the same signal cascades. Each of these cytokines is increased in lesional psoriatic skin (36) and is thus a potential therapeutic agent. We thank D. McDowell for laboratory administration, J. Baer for help and advice with animal care, and R. Sowmayalakshmi and S. Schwarz for comments on this manuscript. ↵1 This work was supported by a grant from the National Institute of Neurological Disorders and Stroke (to P.H.P.) and a fellowship from the Korean Ministry of Science and Technology (to S.C.L.). ↵2 Current address: Department of Pathology, University of California, Los Angeles School of Medicine, 675 Young Drive South, Los Angeles, CA 90095. ↵3 Current address: Department of Pharmacology, Meiji Pharmaceutical University, 2-522-1 Noshio, Kiyose, Tokyo 204-8588, Japan. ↵4 Current address: Protein Engineering Division, Korea Research Institute of Bioscience and Biotechnology, P.O.B. 115 Yusong, Taejon 305-600, Korea. 6 Abbreviations used in this paper: LIF, leukemia inhibitory factor; AdlacZ, adenovirus coding lacZ; AdLIF, adenovirus coding LIF; AdPacI, adenovirus with no transgene; X-Gal, 5-bromo-4-chloro-3-indolyl β-d-galactoside; RT, room temperature; KO, knockout; WT, wild type. Tofaris, G. K., P. H. Patterson, K. R. Jessen, and R. Mirsky. 2000. 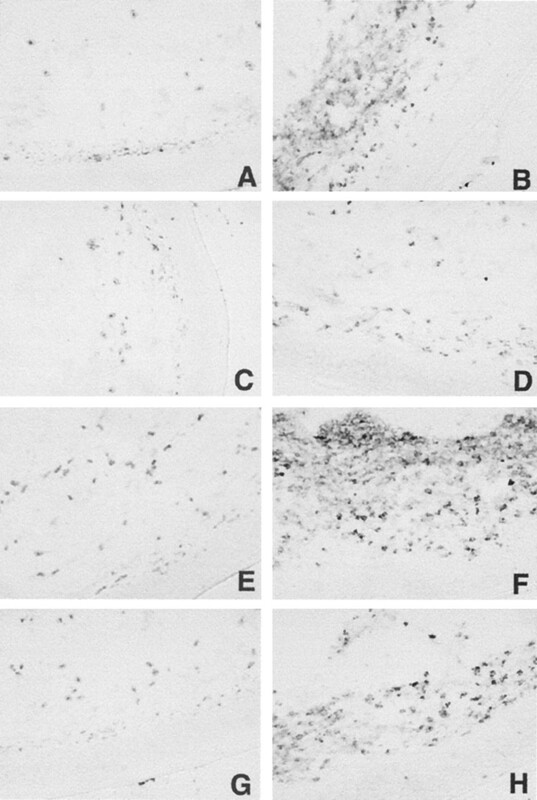 Schwann cells deprived of axonal contact produce the chemoattractants MCP-1 and LIF, which are regulated by autocrine circuits involving LIF and IL-6. Soc. Neurosci. Abstr. 25:223.13.